The terms Stake, Yield (Revenue) and ROI (Return on Investment) confuse many people. We have also noticed many online publications using these terms incorrectly. The sum of money gambled on the outcome of an event. The amount of money played with, or placed as a bet. In the online world of gambling, stakes are electronically placed on a desired outcome with another party that has agreed to accept your stake, whether this be a bookmaker or an anonymous person/group in a betting exchange. These ‘adversaries’ are effectively backing with their own money against your selection, hoping to make a profit of your stake if your selection in the event turns out to be wrong. Once the outcome of the event is decided, stakes are returned to you in full if your bet has won (plus the winnings), or, if you lose the bet, the stake is lost and either retained by the bookmaker, or transferred to the winning side in the betting exchange. Technically speaking, stakes are guarantees! This means that they are short-term deposit payments to guarantee that the losing party can and will honour his debt obligation to the winner of the bet. †ratio = the quantitative relation between two amounts showing the number of times one value contains or is contained within the other. When applied to gambling, Yield measures betting efficiency compared to total turnover. If your aversion to risk is low, you will select bets with higher probabilities. Bets with higher probabilities of winning carry lower odds. Lower odds means a smaller yield. If you enjoy higher risk strategies, the opposite will apply. Generally speaking and depending upon the strategy employed, a good bettor will yield between 5 and 10 percent profit in the long run. In football betting any yield over 7% is considered to be a very good result. A bettor places 38 bets with stakes of 20 units each. The total amount staked [Capital Employed] is 760 units (38 x 20). 33 of the bets win and 5 of the bets lose; the net result [Profit] is a bank growth of 65 units. We come across many forum threads with people talking about their betting strategies; It is also easy to find plenty of websites offering betting systems for sale. What many of them have in common is claims of high yield results, probably intended to impress the reader. If they are to be believed then this is an indication of high risk strategies employed. It must be remembered that in the Yield formula, the sum of money staked (∑MS) includes all stakes, even those that have not been lost. (In other words, the refunded ‘guarantees’). People tend not to understand this fully and as a result mistakenly overstate their yield results. Yield is NOT the same as ROI (Return on Investment)! The ratio of money gained or lost on an investment relative to the amount of money invested. In other words, the profit/loss ratio as a function* for investment† (capital employed). *function = a relation or expression involving one or more variables; in this case, investment, profit, loss. †investment = long-term employment of tangible, financial, or other assets that are not meant for immediate gains but are intended to generate benefits (normally earnings or profits) in the future. ROI is also known as ‘rate of profit’ or sometimes just ‘return’. If you bet systematically, your starting capital will be turned over again and again: It is effectively the same money you are investing. (So long as you don’t lose every bet!). The ROI formula resembles the yield formula, but here, profit/loss is related to the actual investment (starting bank) instead of the total of all stakes (turnover). Returning to our previous illustration, 38 bets were placed, each with a stake of 20 units (760 units staked in total). 5 bets lost but the overall bank growth was 65 units. Let’s assume the starting bank [investment] was 200 units. ROI is always calculated for a certain predetermined amount of time; in finances usually for one whole year, but it is also common and acceptable to calculate the ROI monthly or, in a betting sense, for only the number of bets within a specific time scale. The return on investment index is especially suitable when the amount of capital has a strong influence on the result (e.g. with arbitrage). However, this is probably rarely the case for the majority of punters. Therefore, it is the next formula, profitability, which is the most important one for the normal bettor. If you are just starting and in 10 bets you hit all 10 you can’t devide by 0. So how do you calculate your profitability in this case? Of course you just need to loose one to be able to devide and that will happen sooner or later but till then how do you calculate it? Thanks soccer window for a great article on yields over betting exchanges. Just to understand some concepts. Suppose that these are the odds for 10 bets with a stake of 100 unit each with strike rate of 7 and lost of 3. Your second calculation… a little bit continued.. Sorry as this will sound a very silly question. For record-keeping purposes, I’m a bit sure how to proceed on this. If you’re using betting exchange, should you factor in the commission fee into the Money Won calculation? E.g. I think Betfair take 5% commission. Just using the unaltered yield formula. Let’s say one were to place 40 bets with stakes of 100 units each and with average market odds of 1.50. Let’s suppose that 32 bets hit, and 8 bets miss (although I fear such a great yield may be wishful thinking). So that’s a total money staked = 4000. Sorry for such a long and dumb question. yes, you have to factor in the 5% commission fee of Betfair; Germans have to factor in the gambling tax, etc. etc. I’ll write an article on that topic one day but currently I’m incredibly busy getting the German Over/Under course finished and in print. Have a great Easter and help us to spread the word that we currently have an Easter sales running! Happy Easter to you and the family. Do you mean initially the bank was 200 units (perhaps 10 bets of 20 units were initially placed?). The bettor (presumably) collected profits from those first 10 bets. The bettor then made more bets so from the winnings so that, in total 760 units ended up being staked (a total of 38 bets of 20 units)? I just couldn’t quite follow 760 units were staked (38 bets of 20 units) yet how can there be a starting bank of 200 units? the starting bank of 200 units is an assumption based on The Science of Calculating Winning and Losing Streaks. Further, this example is based on a low risk strategy (38 bets in total, 33 win: 86.8% hit rate; odds: 1.25) and, the example is based on the assumption that the bettor doesn’t place all 38 bets at the same time. Should that be the case then, of course, 200 units’ starting bank wouldn’t be enough. So, say… starting bank 200 units… placing 10 bets in total (20 units each)… after these 10 bets your bank will be (depending on winning/losing) somewhere in the region of 140 units (if you were very unlucky, and 3 bets lost in the first betting round) up to 250 units (if all bets won). Then you can turn-over your bank again… and again… and again… That is why you get different numbers for turnover (Yield) and starting bank (ROI). Wrong. You have ROI and yield backwards. ROI is calculated as profit / total units wagered. I don’t have it wrong. The explained definitions are definitions from the financial world applied to sports betting. Look up Wiki, Investopedia, and so on… not forums! Hi! Do you have any plans to release any more courses? There is a 1×2 course in the pipeline, but I’m afraid I cannot be specific about the time scale for its release. What a great article! Thanks to you guys I’m currently taking a statistics course to learn more about how this all works. 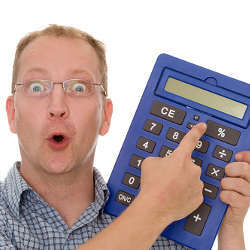 Can’t wait for your new value calculator to come out!